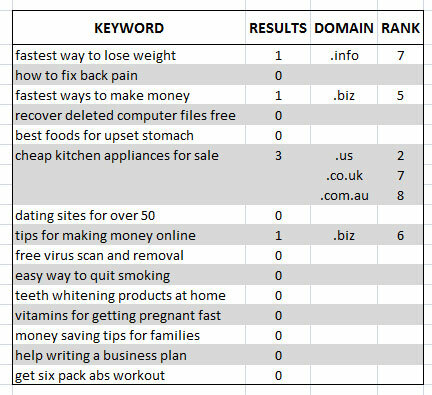 After spending a considerable amount of time researching SEO tactics and strategies, I decided to take a detailed look at just how beneficial (or not) having a .com, .net, or .org domain extension for ranking for your long tail keyword. The last time I analyzed search results, I looked at the correlation between Google PageRank (PR) and SERP rank (rank in Google). However, that study did little in terms of providing you with knowledge you can use to build (or expand) another sector of your business to drive additional, diversified revenue. Let’s take a look! For this study, I looked at 45 different keywords (phrases), ranging from 3 to 5 words in length. The keywords that show more than 10 results on the first page are typically caused by YouTube or other Google-related product results. I wanted to see just how many domains that do not have a .com, .net, or .org extension are ranked on page 1. For this study, I also omitted any .gov, .mil, and .edu domain extensions. 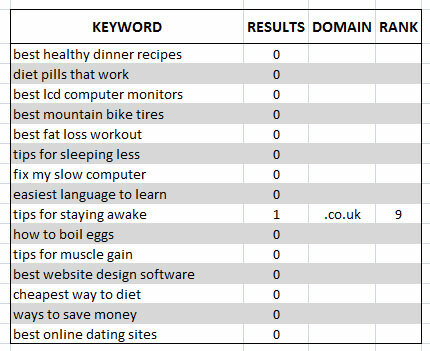 After picking 45 phrases (15 three-word, 15 four-word, 15 five-word) to analyze, I looked to see if any other domain extensions were ranked on the first page, as well as how high they ranked. A lot of data there, but how does it do anything to help you make business decisions? Well, the main reason I went for three-, four-, and five-word phrases for this analysis is that most of the broad terms (one-two words) are taken already. I know for a fact that PLENTY of longer keyword/phrases exist, and many of them have decent search volume – untapped niches. 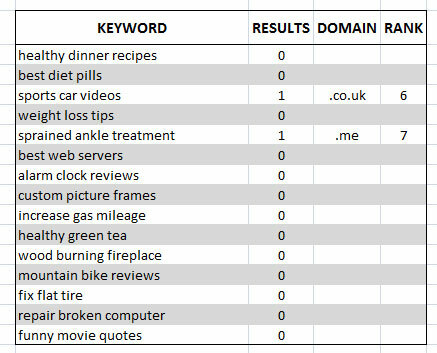 I only looked through 45 keywords (or about 450 total results on page 1), and only 7 non ‘premium’ domains were on page 1. Go for the .com/.net/.org! The more I deal with building sites, the more I believe domain extension plays a role in making it easy to rank. I bought a .net EMD (exact match domain), the keyword having about 900 searches per month. I put a single article (1,000+ words) on the site, a couple other pages, and pinged the site. Within a week, I was sitting on page 1. I’m going to continue to let it sit and see how high the site gets without any backlinks, but I really don’t see why it would go anywhere as it is quality content with an exact match, premium domain extension. Unless something changes, or unless I am doing some kind of other test, I will be buying .com, .net, or .org domains. Let me know your thoughts on this study. I really appreciate your comments and believe they help everyone (generally), including myself. Do you have any ideas for an analysis/case study?